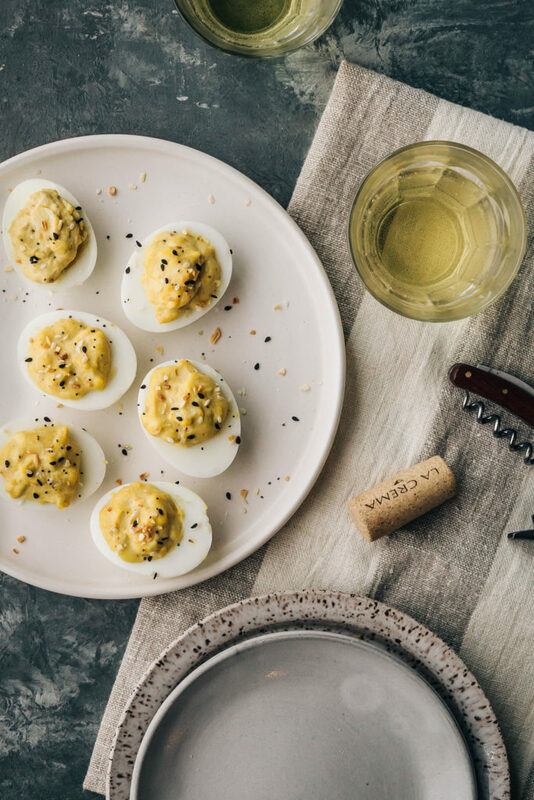 I love a good deviled egg and these miso-mustard deviled eggs are on point! They’re the perfect happy hour snack and taste really amazing with a glass of white wine to help wash them down. These babies have a lovely umami flavor thanks to the miso and the addition of hot Chinese mustard takes things to a whole new level. And hey, if you don’t have the prepared hot Chinese mustard you can substitute with Dijon no problem. What I love most about deviled eggs is that you can taste test the filling as you go so you’re able to adjust the flavors as needed. I tinkered with this filling a bit and I’m really happy with the end result. These would make a lovely addition to your easter table and if you don’t celebrate easter they’ll be even better eaten straight up with a good dinner date. I hope you all enjoy these deviled eggs as much as we do. Pour a glass of white wine and dig in! Place the eggs in a large pot and cover by 1 inch of water. Bring to a boil; remove from the heat. Cover and let stand for 11 minutes. Drain eggs and run them under cold water until cool enough to handle. Peel the eggs and slice them in half. Scoop out the yokes and place the yokes in a medium-sized bowl. Add the mayonnaise, mustard, miso, vinegar and cayenne pepper. Whisk well until smooth and well combined. Taste for seasonings and adjust as needed. Spoon the mixture into each egg half and sprinkle with the toasted sesame seeds and flaked sea salt. Wow! I would never have thought to add miso to deviled eggs but it sounds so good. I’m usually a purist with my deviled eggs going straight for the classic mayo and mustard but this mix is definitely happening in my kitchen! Just made this and it’s a very forgiving recipe. I didn’t measure anything and it taste great. This is an easy way to use miso. This is my new go-to! Like Deb said, it’s such an easy way to use miso that I have in the fridge, and it tastes amazing! Thank you for continuing to share such wonderful recipes!